surgery. This is why, today, aesthetic medicine is on the rise and is seducing more and more people. One such alternative to surgery, is medical cryolipolysis. For a few years now, my team at the Centre Victoire in Toulon, has been working on the treatment of localised fat folds on the abdomen, love handles and “saddle bags”, with the use of the CRISTAL® system, which is based on Cryolipolysis technology. Convinced by the visible results, Centre Victoire Toulon has decided to tackle areas that were previously impossible to treat with non-adapted, conventional applicators! Thanks to the latest technological developments, our center has just adopted the AGATE® module, specific for the treatment of small areas, such as the chin, the inner knee and face contouring. These new applicators, existing in different shapes and sizes, are designed to target precise and more restricted areas of the body. Thanks to CRISTAL® medical cryolipolysis, it is now possible to treat any zone that is a source of complex, for both men and women. Harmonizing your whole body is now possible and we can claim a great improvement of the silhouette! The significant results motivate patients and encourage them to maintain a healthier lifestyle. For the treatment of a double chin, it is necessary to expect a session of about 45 minutes, which can be repeated twice if necessary. The goal is to remove fat cells exposed to cold and ischemia, through apoptosis, “programmed death of fat cells”. This process is inconsequential for other tissues of the body. The fat cells die and are naturally eliminated. To optimize the results, it may be advantageous to combine different techniques, for example cryolipolysis with fractionated radiofrequency. In fact, once the fat fold is treated by cryolipolysis, the fractional radiofrequency induces a retightening of the skin for an even more visible result. 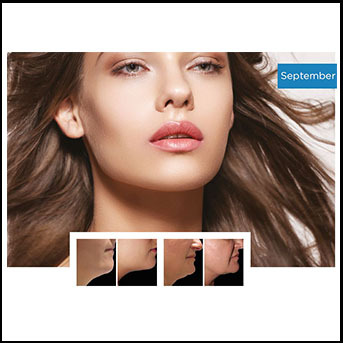 continually trains on the latest technical innovations in Aesthetic Medicine.